Your eyes do not deceive you. 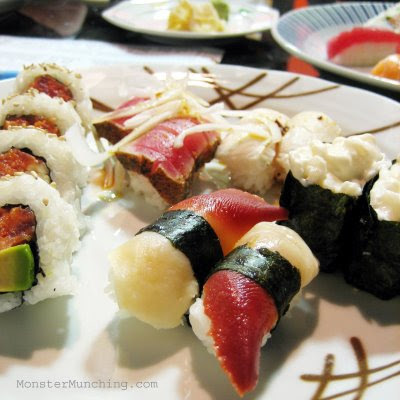 This is the same Sushi 5 I reviewed back December of 2006. The same Sushi 5 that marked my first foray into kaiten sushi, otherwise known as conveyer belt sushi. Since then, I moved on. Despite it being within blocks from me, when I got the hankering to attend a sushi parade, my choice has been Kaisen Sushi in Santa Ana. There were more customers there, which meant more turnover. As Martha Stewart might say, turnover is always a "good thing" with revolving sushi. Sushi 5 was a ghost town compared to Kaisen. Although their prices were reasonably low, hardly anyone bit. All that was missing was an errant tumbleweed to bounce by. Maybe crickets. The revolving sushi concept wasn't working here. Case in point: I had lunch with a co-worker a few months ago. We were the only customers. And there's nothing sadder than to to see a lone piece of sushi ride on a ever-looping conveyor belt, on a never-ending victory lap, waving to an audience of two. Funny part was that even as we ordered our items fresh from the menu, the itamae had no other choice but to send it rolling on down the line. Since we were seated at the far end of the restaurant, the elapsed time was nothing short of comedic. It was like like we were waiting at the airport baggage claim while the taxi was idling. In the middle of it, my impatience and hunger got the best of me: I got up and plucked our sushi orders mid-journey. The owners at Sushi 5 got wise to this problem. They've recently ripped out all the conveyors, built a traditional long bar in its place. Don't get me wrong: The concept of revolving sushi is not dead. As we speak, a new revolving sushi place called Kula is being developed at the Diamond Jamboree shopping center in Irvine. But it is dead at Sushi 5. Dead, gone and nearly forgotten. What they didn't do away with are the bargains. 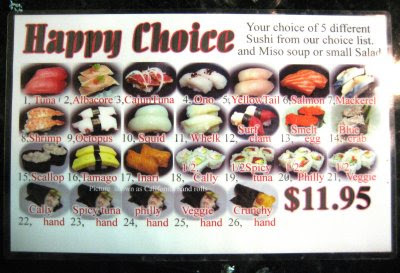 Sushi 5 now offers a special deal (a permanent one, by the looks of it), where you pick 5 kinds with 2 pieces each from the picture list for $11.95 (which also includes a bowl of miso soup and a salad). That's 10 in total, at about $1.20 a piece. The best way to do it is to bring a friend and have them pick out items that you haven't scoped. When you share your bounty, you both will make out tasting ten altogether different pieces. So, how is it? I'll tell you now that it can't touch Sushi Shibucho or Sushi Wasabi, which shouldn't surprise you. But then you're not spending $40-$100 per per head either. If you want me to get specific, Sushi 5's salad was a bit overdressed; the miso, solid; and the sushi, virtually unchanged from what I said about it the first time around. The crab flaked like crab. The scallop gets drowned in mayo. The surf clams crunched. And the Cajun tuna tasted like Emeril "bammed" it. Sushi 5 is good and decent and cheap. Good enough and cheap enough to prove that the words "value" and "sushi" are not mutually exclusive. And now at Sushi 5, with less travel time. *Update (July 27, 2009): Reader dh has informed me that Sushi 5 shuttered on Saturday July 25, which was a day after I had this meal. Confirmation to follow later today. John's Incredible Pizza Company, to quote Austin Powers, usually "ain't my bag baby." By inference and transitive property, neither is Chuck E. Cheese, nor its adult version, Dave & Buster's. 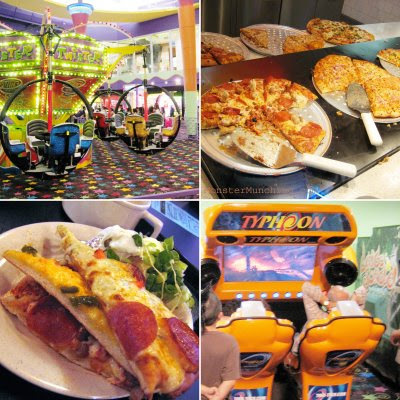 But John's Incredible Pizza Co. is more than that (or less, depending on your angle), since it is also an all-you-can-eat, stuff-everything-into-your-gaping-maw-to-get-your-nine-dollars-worth buffet. Had I not been starving, I would have had a more blistering critique of it. Unfortunately for you haters, it was the exact right moment in time for me to form a semi-positive opinion of the place. Before I get into the food, I need to talk about a few other details. The property reclaims 60,000 square feet of what used to be the entire lower level of the old Buena Park Mall, which under its new name of Buena Park Downtown is still suffering through the same sour-economy doldrums before they made the upgrade. The expansive digs fits what I imagine must be a Dodger Stadium's worth of customers -- the same customers the mall developers are hoping would boost the prospects of the rest of the complex. Through John's doors, I saw hundreds of people entering, but only a scant few exiting. It was like a clown car in reverse. 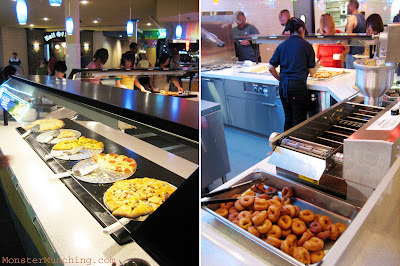 Or a buffet black hole that seemed to violate the first law of thermodynamics. To get in there yourself, you must pass through a maze of metal bars, weaving around dizzying S's until you reach the cheese...I mean, the cashier. I've seen similar enclosures in cattle pens, prisons, and yeah, Disneyland. While waiting in the queue I remembered the few comments made on a post I wrote announcing its opening (which was a week ago). Most noted the class of clientele. "They're hillbillies," one poster warned. Expecting to see a denim overall and a corncob pipe convention, I kept a lookout. But what I found were people. Yep, people. Just people. Like me. Like you. Like your next door neighbor. But since I was intent on finding a hillbilly in the crowd, I actually did locate one. I couldn't help it. He was a few paces ahead of me in line, and I could do nothing else but look when I saw him: a living, breathing doppelganger of Cletus the Slack-Jawed Yokel from the Simpsons with a trucker's cap and a goofy grin revealing a surplus of gum and a few missing teeth. Though immediately after I made the association, I felt bad. Who am I to judge? What do I look like to these people? I shudder to know what they'd think of me. Once we cleared the queue, it was off to pick one of five themed rooms to sit in. Cletus went into the sports-themed room. We beelined into one dubbed "Toon Time Theater" since we had a five-year old in tow. In this room, projectors looped Warner Bros. toons onto a canvas screen. Cartoon posters from every studio hung on the walls and made it a non-denominational place of toon worship. Okay get on with it, you say. How's the food already? Well, it ain't Mozza or Pizzeria Ortica. Surprised? If so, I need to also inform you that straight-to-video movies don't win Oscars. The crust is like the kind one would expect from any number of chain pizza stores -- spongy, over-leavened, absent of crackle and more inclined to become a breadstick than a proper pie. To put it simply, the pizzas are designed to be loved by their target audience: kids of a certain age who would rather eat paste than brussel sprouts. Case in point: there's a peanut butter pizza, which, true to its name, had a thick, stick-to-the-roof-of-your-mouth layer of it substituting for marinara. To me, it was vile; a crazy Nickelodeon experiment gone wrong. But to some 8-year-old, it might as well be Thomas Keller. A spicy pasta fagioli contained enough beans to make for a fragrant rest-of-the-night -- a decent soup to be sure, but for the sake of my passengers, I didn't get seconds. I ran into Cletus again at the baked potato bar, where he was struggling to unstick whipped butter off the ice cream scoop and onto his potato. I had the same problem with it, as it turns out. Me and Cletus, we're the same. Though the baked potato was just a baked potato. Pesto garlic pizza was a sort of revelation -- it had a pronounced herby flavor as advertised. And though I first recoiled at the thought of the nacho pizza, it worked! I took another slice to confirm that I liked it, and I did. Perhaps the only thing that trumped those two last slices of pie were the donuts produced by a machine/conveyor belt that spat out batter at one end, slightly-crispy golden-brown loops at the other. I took a few, piped some soft-serve on top, a spoonful of rainbow sprinkles, and went back to eat it in the cartoon room. I was not completely unaware of the irony. 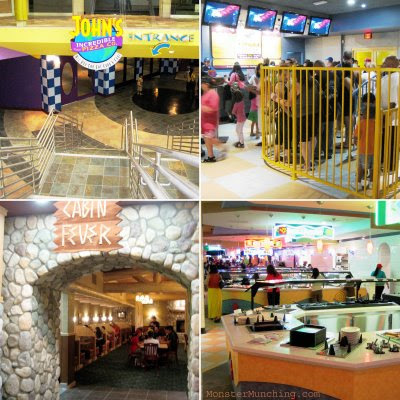 Then after all that, we went into the game area, where kids weaned from baby formula to fast food would become addicted to gambling by way of carnival games, noise, and flashy lights. Las Vegas, I present to you your future customers in training. We all know that Cream Pan makes the best strawberry croissant Orange County has ever seen. But the bakery does amazing things with its savory items too. Among others, they've got crustless sandwiches using pristinely white, Wonder Bread-like loaves of their own making; weird but delicious dinner rolls stuffed with yakisoba noodles; and ham and cheese folded inside the buttery creases of their crisp croissants. The latter is perfect for breakfast with a scalding cup of strong black tea. But I contend that the best savory thing Cream Pan makes requires no baking and no flour. It instead relies on the staple starch of Asia: rice. 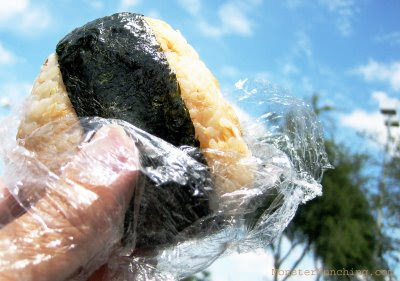 It's called onigiri, and it is what a sandwich would look like if you made it out of Asia's most important crop. Most Japanese-to-English translations define onigiri as a rice ball; but that's slightly inaccurate as most are triangular, not spherical. And also, there's almost always nori involved. The nori's utility is twofold. It adds a fishy, fresh-from-the-sea flavor, while also giving the eater a place to grip without getting sticky rice fingers. You can find onigiri almost anywhere bento boxes are sold. Mitsuwa Market sells it in their fridge at the back of the store. But if you get the salmon onigiri there, you'd need to squint to find the small marble-sized chunk of fish they embed in the center. Rice comprises most of its volume. 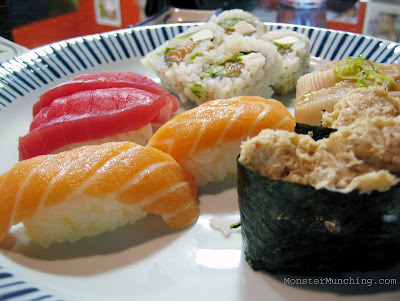 Each nibble taken makes you wonder, "How many bites does it take to get to the salmon center of Mitsuwa's salmon onigiri?" But Cream Pan? They do one better -- they mix the salmon meat into the rice before sculpting. The result? Salmon and rice in every bite -- every mouthful a perfectly proportioned ratio of the two ingredients. The first chomp is as wonderful as the last. Of course, if you don't want to plunk down the $2 for the treat, onigiri is one of the few Cream Pan items a home-cook can easily duplicate in their own kitchen (I've tried making their strawberry croissant myself and concluded it's cheaper to buy it). The ingredients and method to assembly is as simple as this: mix rice and cooked salmon, form triangle. But in case, you need more specifics, I have included a video instructional on how to make different styles of onigiri courtesy of my favorite YouTube cooking show: Cooking with Dog. One Friday, a few weeks ago, I was at The Chippy for my weekly dose of fish. Yes, it was fish and chips, because what better way is there to get your essential omega-3 fatty acids than having it battered, fried, and crunchy, served atop french fries? Then I found the answer: a dessert of banana ice cream as chaser. Even better: I didn't have to pay for it. Next to the order line was a sign scribbled on a dry erase board, which proclaimed: "Today's Special: Free Banana Ice Cream With Every Combo Purchase." So after my oh-so nutritious lunch, I claimed my complimentary scoop -- a fluffy, whipped-up-with-air, frozen amalgam of sugar, milk, and cream packed with so much banana flavor it can be classified as a monkey narcotic. "How'd you like the ice cream," the Chippy guy asked later. "Awesome," I said, "did you make it?" "Oh no. It's from this little place I like in Santa Ana." "Ah, Hans' Homemade," I said, obviously very satisfied with myself. "Yes!" he said surprised, "You know it?" "Yup, but I had no idea they had banana." So after a long time away, I made my way back to the source of this divine dessert. Partly because The Chippy wasn't going to offer it every Friday and partly because I couldn't wait until Friday even if they did. I found Hans' the same way I left it almost a decade ago. 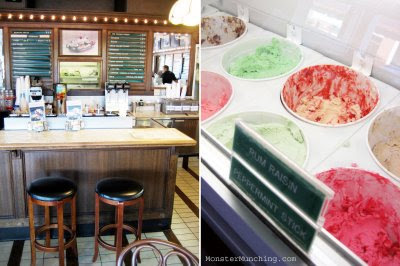 It is just as it always was: an ice cream parlor caught in a time warp. The place oozed old-time parlor nostalgia -- it looks cribbed from a Norman Rockwell scene of Main Street U.S.A. circa 1945. A bar area is still equipped with cushy stools and phosphates are still on the menu. Unfortunately, the banana ice cream was not. Not that day, at least. So instead, I took their green tea ice cream ($3.50 a scoop) as a substitute. 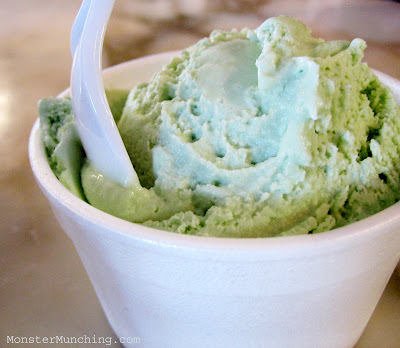 Though it possessed Hans' characteristic fluffiness, the flavor was unlike any green tea ice cream I've ever had before: too sweet and strangely minty...too minty. It was so minty, in fact, that I wondered whether the peppermint stick flavor in the tub adjacent to it had seeped in by osmosis. Whatever it was, I didn't like it. Of the 55 flavors that Hans puts on the roster, this wouldn't be one I'd vote to keep, especially if he's making it instead of that amazing banana!